Rating: 5 of 5 stars - Recommended Read! Having never read Christopher Rice's work before, I went into this with my eyes wide open - and it wasn't long before I wished I had left them closed. Tightly closed. As I worked my way through the story, I could feel my anxiety and trepidation building as my adrenaline and pulse spiked and my palms started to sweat. Realistically, I knew I was displaying the physical symptoms of distress, but it confused the hell out of me. After all, I was only REA-DING. I'd never had such a visceral reaction to reading a story before. Sure, my pulse had spiked and "things" had hummed and thrummed during hot romance scenes, but this...this was different. In addition to the physical mess my body was fast becoming, I found my mind at odds as well. One of the characters I truly felt sympathy for and liked, another I genuinely wanted to Mother - and yet another I wanted to wrap my hands around his spindly throat, throttling him myself. My emotions, along with my body, were a complete mess. Continuing through the story, it became creepier and more malevolent as I read on. Talk about chilling! I won't give specifics, because that would give away the key factor in the story, killing it for everyone. But, I will say this - you will never, and I mean never, expect what Christopher brings to the forefront in this novel! It's as unique as it is unexpected and creepy-chilling. 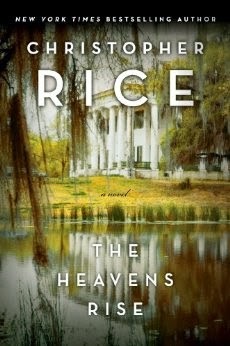 I found myself racing through The Heaven's Rise - I couldn't put it down until I had fully absorbed each slimy, crawly, little devious word. Afterwards, I found myself desperately wanting to take a bath; I felt so...dirty...and cold. Oh God, *shivers* I was so cooold. But, as luck would have it, I was too damn afraid to get in the water at that precise moment, thanks to the images still circulating in my mind. Instead, I found myself sitting back in my reading chair, with my arms drawn up, tightly encasing my up-drawn knees with my blankie wrapped tightly around my shoulders desperately trying to warm the deep chill I had sunk into, quietly shaking back and forth trying to sooth myself. And that is exactly how my husband found me - something I know I will never live down. Thanks Christopher Rice for briefly turning MY mind to gelatin, thus allowing my husband to capitalize on my temporary weakness. My husbands first words? Were they words of comfort? Maybe an arm draped around me to offer comfort? Na-ope! His exact words were, "Guess you finished reading that Novel, hu? My turn!" he yelled, as he snagged it off the edge of my chair, turned and ran down the hallway. Seriously? I'm almost catatonic with fear, my mind in a continual terror-loop, rewinding and replaying the days after I watched Jaws for the first time and was so afraid of any water, even my parents couldn't get me to sit on the toilet, and he...jokes, running down the hall with his prize? If I'd had my full wits about me, I would have charged him for the privilege of reading the damn thing before he snagged it, wiping the smile off of his smug face. ! I have one word to describe the feeling - BETRAYED. In ending, Christopher's characters had depth, carried their individuality through the story and were well-developed; when you love, hate and somewhere in-between, you know that the author has made a perfect hit. The premise of the story is new, unexpected and incredibly original; a thrilling suspense-horror surprise in a market too often overwhelmed by the "alike." The scene-building is astounding! As I read, it felt as if I was walking through the story, able to visualize every detail and clearly see the grit and grander that makes up the amazement of the Louisiana Bayou. New Orleans is the one place in all the world I long to visit and I was thrilled (when not shivering or heaving) to get the opportunity to see the environment through this authors eyes. I RARELY give 5 stars - but this novel deserved it.